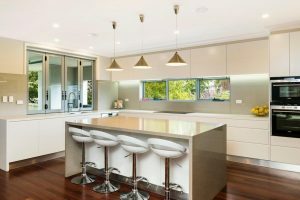 Kitchen Renovations Bendigo – Not long ago we spoke about how an electrician plays an important role in Bathroom Renovations; this is just as important when it comes to Kitchen Renovations. There are even more things to consider electrically when renovating a kitchen; such as electric wall ovens, hot plates, range hoods, extra or updated PowerPoints & even upgrading your switchboard. A lot of customers do not even consider their switchboard when planning a Kitchen Renovation. You need to consider the load that new wall oven or hot plates are going to have on your switchboard mains; this is a simple remedy during the planning stages if you take this into consideration. Most homes being renovated are older, so it’s also important to consider the safety and integrity of the existing installation wiring and switchboard. Some older switchboards do not have a safety switch which nowadays is a legal requirement – for the safety of you and your family. So if you planning to give your kitchen a makeover, remember to update your electricals. You will thank yourself later.